After a brief run obsessing over the miniature puppets from Trey Parker and Matt Stone’s stop-motion animation, Team America: World Police, Seattle’s Troy Gua took it upon himself to begin building miniature models of things and people that he loved, from his wife to Michael Jackson and Salvador Dali. His biggest accomplishment with these miniature buddies, though, has come with Le Petit Prince — his polymer clay rendering of the man, the artist: Prince. 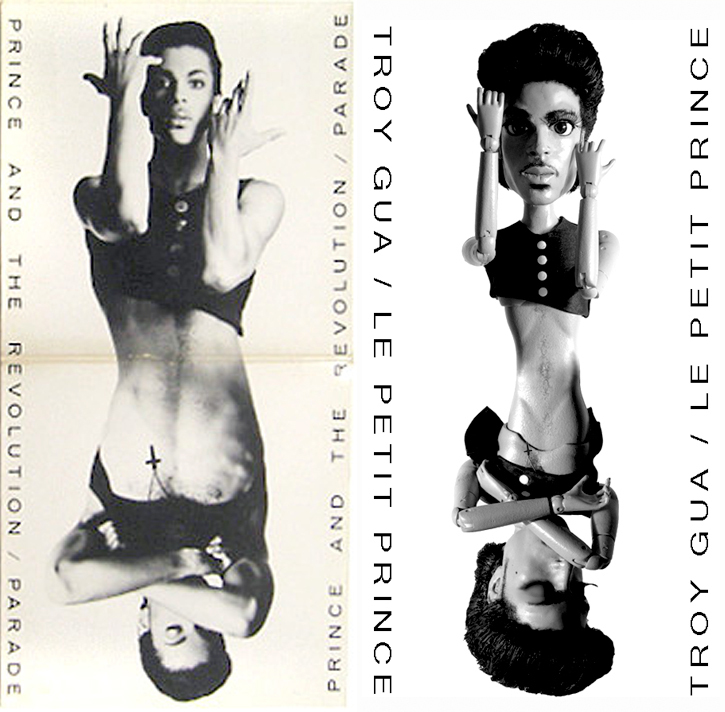 What began as a playful nod to a man that has inspired Gua since his youth has since turned into a joyous and involved production, thanks to momentum generated by word of mouth and Prince fan sites and blogs around the world. In this interview with Gua, we discuss techniques, memories, and inspirations, and tie it all together with an eleven-track mixtape full of Gua’s most loved Prince songs. 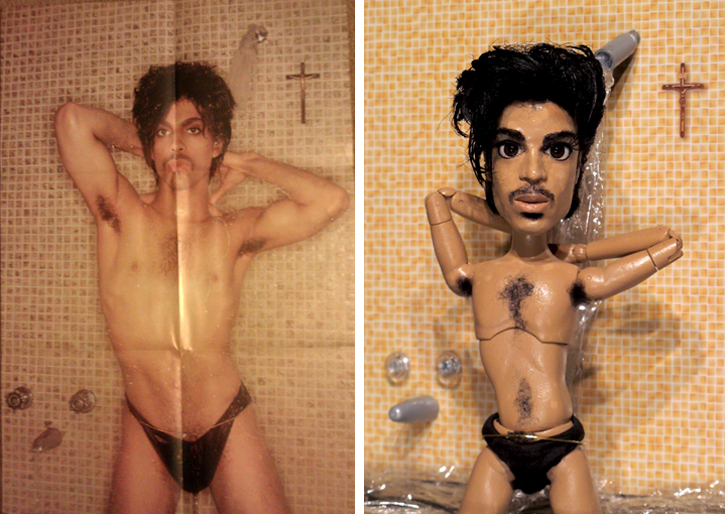 Put yourself in Gua’s universe for just a minute, and envelop yourself with all things bizarre, all things decadent, all things foxy, and all things Prince. You mention that Prince changed your life and your view of life at an early age. Could you maybe touch on how? Prince was introduced to me by my sister right at the moment when puberty began to work its magic on me. With hormones a-raging, I was immediately transfixed by this ultra-sexual, androgynous, other-worldly creature’s equally alien and ambiguous music, message, and indeed his entire aesthetic. He was so confident, so self-assured, so astoundingly talented, so… weird. He taught me that it was cool to be different, cool to express myself with my clothes and my hair, cool to be… weird. It was exactly what I, as a skinny, awkward pubescent boy who always felt different, needed – a hero that I could relate to and aspire to be like. I wasn’t a musician, but I was always an artist, and Prince’s musical virtuosity has always inspired me to be the best I can be at whatever I choose to do artistically. And his eclecticism showed me that I didn’t have to stick to one thing, one style, one type of art – that it was ok to explore as many ideas and ways of expressing myself as I saw fit. And I do. He’s been the single biggest influence on my life and work. Would you like to share an anecdote where Prince played a role in your life? Prince’s music has been my personal soundtrack for as long as I can remember, and he serves not only as a vital component of my inspirational, creative, and stylistic DNA, but also a social measuring stick. A few years back, on my first date with a beautiful woman I had met online, I wore my 1985 concert tee (which is my lucky shirt) to gauge her reaction to it. She dug it. It was true love. We married two years later to the day. I’m not gonna say it was the lucky Prince shirt that got her, but I’m not gonna say it wasn’t, either. 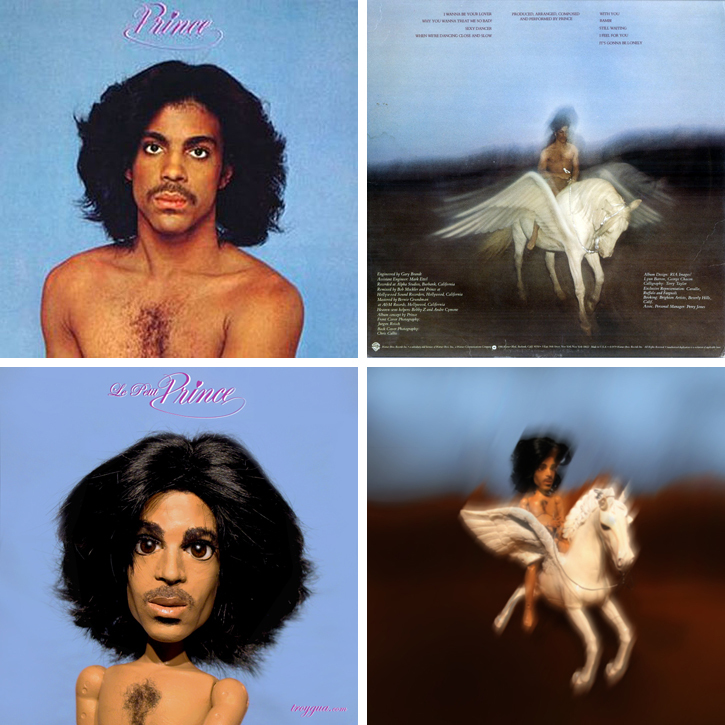 A collection of Troy Gua’s favorite Prince and Prince-related songs. Was there a particular moment of inspiration that led to your wanting to undertake this insanely intense project? I’ve been fascinated with Gerry Anderson’s work since I was a kid: Thunderbirds, Captain Scarlet — those odd sci-fi marionette films from the 1960s that inspired Matt Parker and Trey Stone’s Team America: World Police. Well, when Team America came out, my buddy and I went to see it every Friday for 6 weeks, and we decided to try to make our own miniature likenesses out of Sculpey, a polymer clay. We did, and in the years since then I’ve made 1/6 scale versions of my wife, Catherine, Salvador Dali, and Michael Jackson. I always knew that I was eventually going to make a little Prince, but I knew I was going to have to make it absolutely perfect, and that was daunting, so I just let it simmer on the back burner. At the end of 2011, Prince came to the Tacoma Dome and Catherine and I went, of course. It was my 6th Prince show, and it hit at the end of a long year full of hard work. I had been making and thinking about work that was cynical, art world-referential, and less than fun. I was feeling a little lost and unsure about the future of my art career in Seattle, and I just wanted to make something fun that didn’t have anything to do with the contemporary art world. It was just good timing. After working with Little Prince for so long, did your view of his “character” change? It’s really only been since the New Year; I’ve just been working with him non-stop. The different looks and sets and such have really let me reexamine some of the reasons that I fell in love with this guy in the first place – his ability to pull off the most bizarre and outrageous stylistic choices with a straight face and complete confidence, and with the hot ladies by his side. So, in other words, the project has just reiterated what I already knew and felt. It’s been very nostalgic and cathartic for me going through all the different styles and eras and reliving those feelings again, remembering where I was, who I was, who I was with when I heard this or that album for the first time, saw this or that video or movie, attempted to emulate this or that look. It’s really been an amazing stroll down memory lane. Which pieces were the most challenging to create? 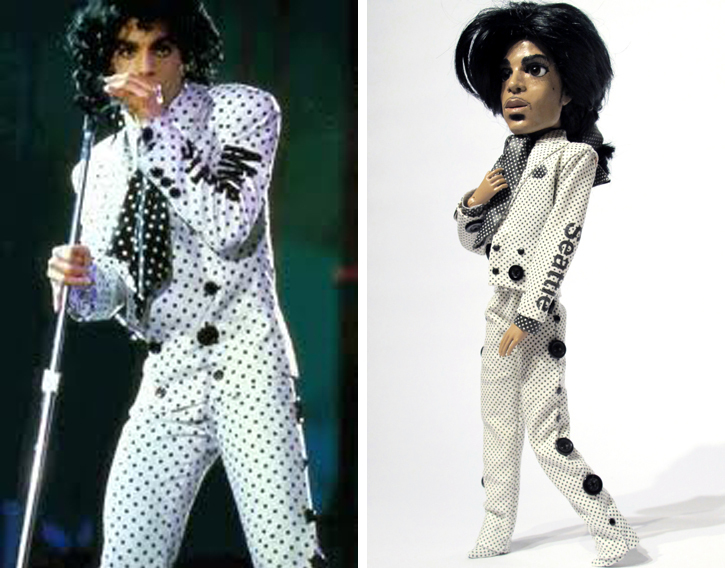 Some of the intricate clothing during the Purple Rain era, with the ruffles and buttons and such, were pretty difficult. I had never used a sewing machine before this project. 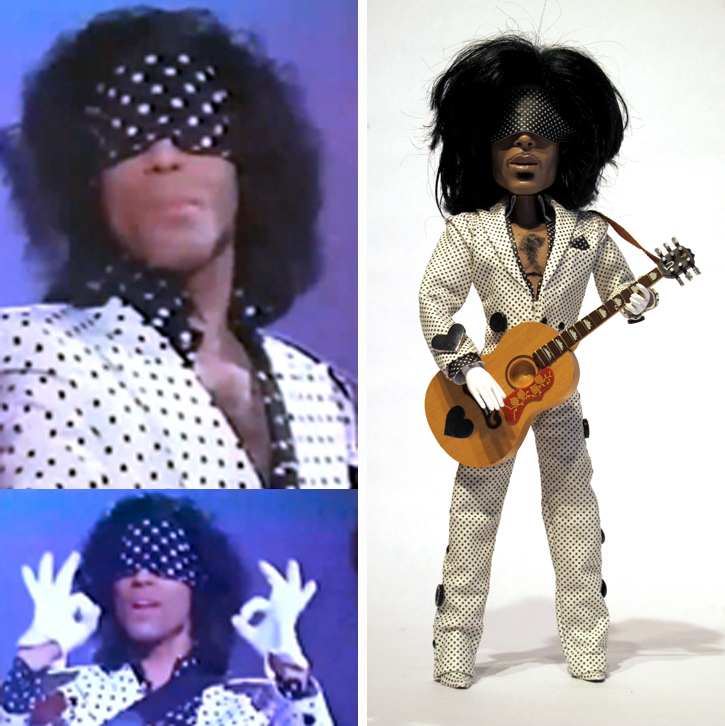 I made the figure, and then began asking around to find someone who could make me a tiny Purple Rain outfit. I got some high quotes and my wife encouraged me to do it myself. She helped me make the Purple Rain coat, and I’ve pieced together some outfits from other sources, but for the most part, I’ve made everything myself. The motorcycle was the single most-difficult item. It’s a 1/6 scale Tamiya model, but they don’t make a model of his particular bike, so I modified it the best I could to make it look like Prince’s movie bike. I fabricated the front windshield fairing and seat assembly myself. Some of the hats and jewelry were tough, too. But it’s all so much fun, really. It’s problem-solving, trying to figure out the best way to recreate these things in 1/6 scale. Problem solving is what most of my work tends to be, anyway; I get visions of completed works in my head and then I go about the work of realizing them. … is the backdrop in the Purple Rain picture real…??? No, it’s Photoshop magic. I found an image of the empty set used for the album cover/movie poster online – it was like striking gold. Now that you have gotten a non-self-indulgent project out of the way (as that’s what caused you to begin the Little Prince project to begin with): what’s next? Well, there’s a lot more to do with this project, and I plan on publishing a picture book. I’m pulling back from posting all the images online so that there will be some craving and demand when the time comes to put it out there. 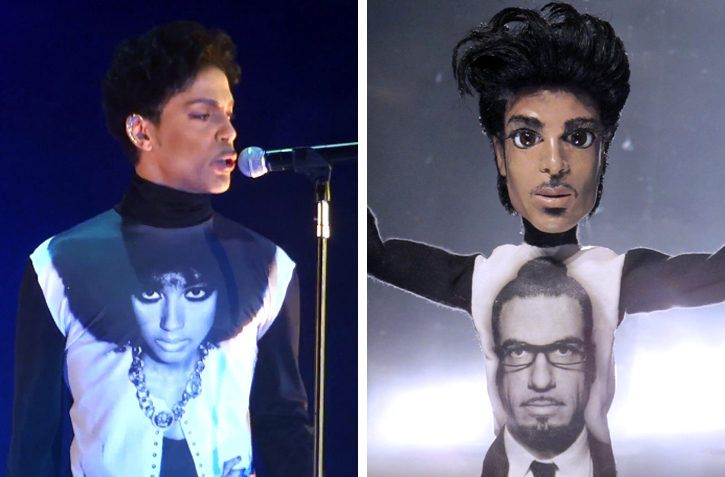 I’d also LOVE to animate and recreate scenes from Purple Rain (or if I’m gonna dream big, the entire movie). But besides Le Petit Prince, I’ve also got a couple of collaborative projects coming up, a panel discussion at Gage that I’ll be participating in, some Colorbandz™ portrait commissions, as well as a Fab.com sale featuring my Pop Hybrids series. I’m talking to a few out of town galleries, and I’m really concentrating on getting my work out to rest of the country (and the world) and hope to continue to line up shows in other cities. Is there any desire to try this with another character in the near future? This project really has taken on a life of its own. I made Le Petit Prince and posted a couple of pictures on Facebook and my website, and those got picked up by a big Prince fan site. From there it was picked up by other fan sites around the world, posted on countless blogs, shared all over Facebook and Twitter, and I began getting tons of hits on my website and so many requests to buy the doll I couldn’t keep up with them (he’s not for sale and there’s a note on my site that addresses this issue and hopefully answers other frequently asked questions). I’ve made so many new friends and been showered with so much praise for this little guy that I’m humbled beyond words. It started as a tribute and a fun project and it has really turned into something much bigger. I hadn’t planned on making all the different looks and photoshoots – I was simply answering requests and working off the energy from the tiny dude’s new fans! It has been a blast, an honor, and I can’t thank everyone enough for all the positivity and love that I’ve received for the past two months. I’m still in the lab, conjuring up more images, and when the time is right, I’ll unveil them. Until then, I plan on dropping some bonus pics here and there. Le Petit Prince makes people happy, and making people happy is addictive. I can’t just quit cold turkey.